Dia de los Muertos (Day of the Dead) might strike you as a light-hearted celebration accessorized by skeleton face paint and flower crowns, but the Mexican holiday is actually a multi-day remembrance of friends and family who have passed away. Despite its close proximity to Halloween, Dia de los Muertos is not a celebration of horror stories and garish costumes, it’s an opportunity to commemorate those no longer with us. Still, it’s a holiday meant for reflection and merriment, not heartache. It’s also a great time to learn more about Mexican culture, and – whether or not you’re already educated – celebrating it. Lucky for us, San Francisco’s Mission District has long been a primarily Latino neighborhood, and the community spirit is strong during the Day of the Dead. Whether you’re coming from out of town or walking out of your front door straight into the festival, here’s your guide for everything you need to know about Dia de los Muertos in the Bay Area. If you’re in San Francisco proper, you’re going to want to make this grassroots event your main focal point. Since the early ’70s, the Mission District has been ground zero for Day of the Dead celebrations with altars in Garfield Park and a parade through the streets. This year’s procession is at 7pm on November 2, commencing from 22nd and Bryant. Not one for parades? You can also observe and contribute to these altars from 4-11pm in the park at 26th and Harrison. Bring flowers, candles, and mementos of loved ones to place on altars that serve as a community graveyard for the night. The interactive art event is alcohol-free, so be respectful and save your tequila consumption for later. This year’s theme is inspired by shoebox altars, so you can prepare a small box altar ahead of time and bring it to the park to contribute to the surroundings, if you choose. At 7pm, a procession takes you through the Mission with performances and live music. The 34th annual Day of the Dead Ritual Procession begins at Bryant and 22nd St. and welcomes nearly 15,000 people in full costume (think skeletal face paint, black veils, and floral headbands). If you’re coming from out of town, getting to the Mission District is easier than almost any part of the city. It’s notoriously flat, which makes walking or biking a breeze, plus it’s centrally located and reachable by several Muni and BART lines. Let’s be honest, you’re just going to Google your route if you choose this option, but there are tons of bus lines to take you to the Mission, depending on where in the city you’re coming from. BART stops running at midnight (we know, it’s absurd), but it’s still your quickest option for getting to Garfield Park. If you’re coming from downtown, you’ll want to hop on an SFO or Millbrae-bound train to 24th St Mission. If you’re en route straight from the airport, grab a Richmond or Pittsburg/Bay Point train into the Mission. From 24th St, it’s just a short stroll to Garfield Park or the beginning of the procession. Visitors -- did you know that San Francisco is only 7 miles by 7 miles? (Residents -- are you tired of hearing this fact?) That means that you can get almost anywhere by foot with the help of an entertaining podcast. And those pesky San Francisco hills you’ve heard so much about? They tend to stay away from the Mission, so depending on where you’re coming from, you might be able to skirt them entirely. San Franciscans love to bike, and designated bike lanes make it super easy (and safe) to get around the city. If you don’t travel with your own (because why would you?) there are several companies offering bike shares. Pick up a Ford GoBike at the closest pickup point to you, then drop it off in the Mission near the festival (at Valencia St and Cesar Chavez St or Precita Park). Check out SOMArts’ special Dia de los Muertos Exhibit that runs from October 6 through November 9. Now in its 18th year, this year's theme, Remembrance and Resistance, focuses on mourning in the midst of resistance struggles (including lots of contemporary artwork). Curated by René Yañez and Rio Yañez with assistance from architect Nick Gomez, the event features work by more than 60 artists that expands beyond the traditional altars. On November 9, pop by the SOMArts gallery for your last chance to see the artwork at their closing celebration from 6-9pm. A Día de los Muertos-inspired artist market is accompanied by live music by San Francisco band Candelaria and live dance performances. Now in its 27th year, Polanco Gallery presents a large altar and an array of Dia de los Muertos artwork in the gallery. For ten years, the San Francisco Symphony has been celebrating Dia de los Muertos with traditional community concerts. On Saturday, November 4, the symphony is joined by Mexican singer Eugenia León, whose musical roots trace back to the nueva canción movement in Mexican folk music of the 1970s and ’80s. A matinee at 2pm offers a more traditional program geared toward the whole family, featuring the San Francisco Symphony; notable Mexican conductor Alondra de la Parra; and Eugenia León performing short Mexican orchestral works, songs specific to the holiday, and León’s own catalogue of hits. At 8pm, León performs an intimate acoustic set without the SF Symphony for the older crowd. San Francisco isn’t the only place to participate in a walking procession and check out some altars. Just across the bridge you can celebrate in Oakland, Berkeley, and down in the South Bay. Downtown Berkeley hosts a family-friendly event on November 2 from 5-10pm on Kittredge St and Harold Way. You can participate in DIY art projects like ceramic or sugar skull painting, listen to Mariachi music, and get your face painted like a skeleton for free. Food trucks and a wine and beer garden keep you satiated while you peruse art and craft vendors. Don your costumes and traditional Dìa de los Muertos papier maché giant heads and bring photos of loved ones, candles, breads, or flowers to add to altars created by local artists and students. Join over 60,000 people in the vibrant Fruitvale neighborhood of Oakland for the 22nd annual The Unity Council Día de Los Muertos Festival. This outdoor festival runs the gamut from live music and performances, games, and rides, to traditional Latin American artisans and altar installation. Trapped in tech-centric South Bay the weekend preceding the Day of the Dead? The San Jose Dia de los Muertos Festival provides your fix south of the city on Saturday, October 21st. The South Bay’s largest Dia de los Muertos festival features live music, sugar skull decorating, and a very special lucha libre spectacle (anyone who says they don’t love masked wrestlers is a liar). MINA Test Kitchen -- Michael Mina’s R&D lab features a rotating five-course themed menu, and right now it’s a Mexican concept called Mi Almita (how convenient!). On Tuesday, October 31st from 6pm-midnight, the test kitchen is throwing a party featuring all-you-can-drink specialty cocktails and all-you-can-eat beef tacos, pork tamales, empanadas, and chips and salsa. El Buen Comer -- The cozy Mission cafe sets up an altar every year where you can contribute your photos of departed loved ones while you snack on seasonal Mexican food like tamales and atole (a hot beverage made with masa). El Buen Comer is part of La Cocina -- a nonprofit aimed at low-income food entrepreneurs that are primarily women from communities of color and immigrant communities. Sweets Collection -- Pick up these traditional Mexican gelatin desserts (also made by a La Cocina grad) at the Ferry Building kiosk to give as gifts to your friends and loved ones during the procession. Rosa Mexicano -- From November 2-5, the restaurant dons traditional festive decor and serves special holiday dishes like sopa de tortilla, tequila pomegranate BBQ ribs, and Day of the Dead bread pudding. 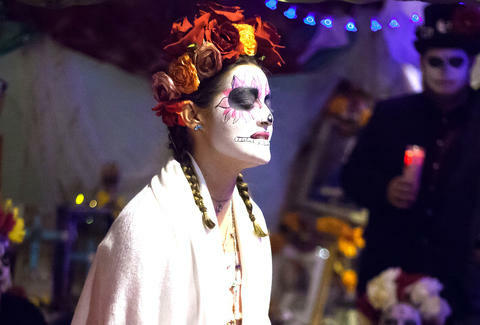 Calavera -- Want an all-out Dia de los Muertos bash? For this multi-day celebration (October 26-November 1), Calavera transforms their Oakland restaurant with marigold decorations and festival altars of flowers and candles. Special food and cocktails highlight ancestral ingredients like heirloom corn, apples, honey, epazote, and platanos. On October 31, a hosted party on the patio features a DJ, face painter, free mezcal and tequila tasting, and complimentary guac bar. On November 1, get swanky with a four-course menu, special cocktails, face painters, a headdress arranging class, and live Mexican R&B band. Comal -- In honor of Dia de los Muertos, the Berkeley eatery blossoms with hundreds of marigolds and hand-painted calavera window decorations. On the night of November 1, party into the night with DJ Jose Ruiz spinning a collection of "death-themed" Latin music. Copita -- Take a ferry ride to Sausalito, where you can participate in both Dia de los Muertos and Hanal Pixan traditions. Hanal Pixan is the Day of the Dead celebrations of the Maya people who live in the Yucatan Peninsula and shares similar themes with Dia de los Muertos. 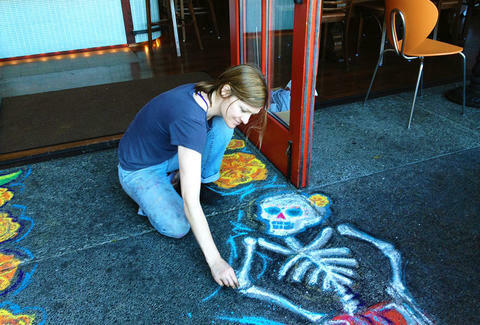 To honor both holidays, Copita offers a special menu and combines marigold flowers with candles, photos, and mementos, and brings its sidewalk to life with chalk drawing of sugar skulls. As you can see, you have no shortage of options. So go ahead and make your own San Francisco muertos adventure; just remember what it is you’re celebrating, and pay some respects to the departed. Maybe they’ll even pay them back.